I just seen and picked up a bottle of Hydrate saltwater solution for hermit crabs at Walmart. 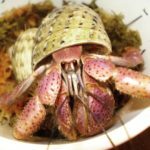 Others may know more but most things marketed for hermit crabs aren't good for them. I would take it back and get instant ocean sea salt. Well I am no pro lol. Just going by what I have learned from all the pros here. I just know the instant ocean has all the good stuff your crabbies need... and yes, most things made "for hermit crabs" are actually bad for them. It might not kill them, but I personally wouldn't use it. I originally started by using that stuff. I guess if you had no other option it would be better than nothing. In the long run you are way better off buying the box $10 of Instant Ocean and mixing yourself. It's way cheaper than buying the $2 bottle at Walmart or $4 at a pet store. It's just aquarium salt and water, which is a handful of elements at most. Real seawater has over 70 different elements and Instant Ocean provides these in captivity. I took my half a gallon of dechlorinated water and my fourth cup of Instant Ocean. That was all the math I had to do to make a small amount. The crabs love it way more than the conditioner I was stuck with before. So I started using instant ocean, and noticed that the pools are evaporating very fast. I've checked to make sure there were no leaks in the pools, but I have to refill the salt water pool daily. Is this normal? How big are your pools? If you have smaller pools the crabs could have been swimming and filled their shells. Also do you use netting in you pools for climbing? The fabric can cause the water to be absorbed into the net then out to your substrate. Do you use bubblers in your pools. I have found that if they bubble heavy that they will empty the pools quicker.